There is one thing I dread about looking after babies. No, it is not about waking up in the middle of the night to breastfeed because that is one thing I can handle. Besides, since we have decided to co-sleep with both the girls, feeding becomes easy because all I need to do is to cuddle, pop the baby to the breast and let her suckle away. What I do not like is to wake up in the wee hours and realise that my bed is wet from a diaper leak. That would mean that I have to switch on the light, carry the baby to the diaper changing station, clean her up, change her into a new set of clothes and then clean the bed. By this time, it inevitably means that I would have woken up the entire household. So, since our first baby was born, we have been trying out many different brands of diapers just to find the one that works best for us. I dare say we have tried nearly every brand in the market and perhaps we have an abundance of pee in the family because so far, every single brand has leaked before. When Drypers offered to send over their new and improved diapers, naturally we were keen to test them out and see if they would be the perfect solution to our quest. Yippee! Drypers Wee Wee DRY for the little one and Drypers DryPantz for the big sister! Wait, you didn't read that caption wrongly. Yes, my elder girl is 3.5 years old now and she still puts on diapers when she goes to bed at night. She is perfectly toilet trained in daytime but judging from how she loves to drink a big bottle of milk before bedtime, it becomes pretty challenging for her to stay dry overnight. So to those parents who have bigger kids and still let them wear diapers, well, you are not alone! We will get there someday and meanwhile, we just have to count on these diapers and make them count too. Good news: Drypers DryPantz now offers XXL sizing! Back in Sweden, I used to apply moisturiser on my girl every day. While the feeling of dryness in a diaper is welcome, making the skin dry up is another thing altogether and a big taboo for me. Thus, I was glad to learn that the new Drypers Wee Wee DRY contains 4-in-1 Botanical extracts (Aloe Vera, Chamomile, Vitamin E and Olive Extract) which helps to moisturise and rejuvenate my baby’s skin. *sniff sniff* Mummy, did you just put powder on me again? For me, I somehow can't help it but dab powder over my baby just to get that sweet-smelling fragrance during a diaper change. 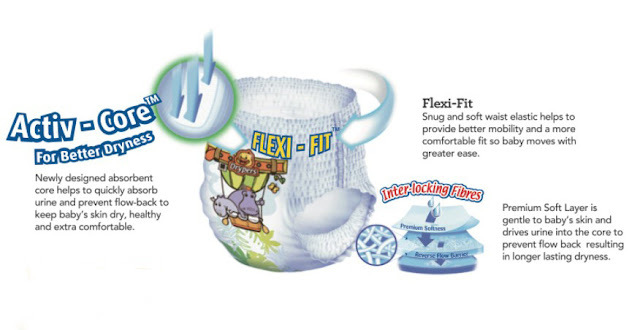 Thus, it was a relief to know that Drypers Wee Wee DRY has a new tape feature – Flexi-Tape which allows for multiple refastening and guess what, it is talc-resistant. No more fear of talcum powder falling onto the tapes! 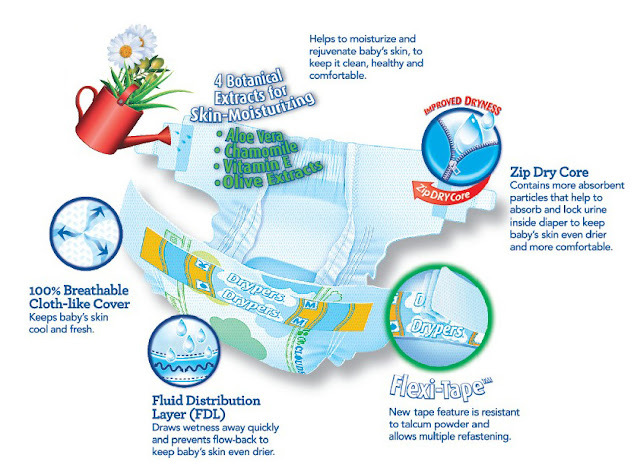 It is probably every mum's dream that a diaper can stay dry for an extended long period of time. So far, Ariel has gone up to 7 hours in the day without a diaper change and her skin is still kept fairly dry and comfortable. Considering how much babies love to pee, that is not an easy accomplishment and credit goes to the Zip Dry Core which has absorbent particles to help absorb and lock urine within the diaper. Before you get me wrong, no I am not saying diaper changes should only happen every 7 hours, you just have to go by instinct and it is pretty easy to tell when your baby needs one! This is what usually greets me every morning. A dry, clean and happy baby. As for overnight, we seldom perform a diaper change for Ariel ever since she was three months old. Yes, we would rather let the diaper swell up than our eyes to swell up from lack of sleep. While it is not a perfect record for Drypers Wee Wee DRY and we did experience leaks on a couple of occasions, I am happy to announce that it is one of the best results we have had so far after trying out the various brands. I kind of attribute the leaks to the fact that Ariel sometimes likes to sleep on her side and she has slept through for over 12 hours before. Oh, and remember the abundance of pee? In considering how delicate baby's skin is and how much I want to protect it, it is a good thing to know that in Drypers DryPantz, the interlocking fibres in the diaper is a premium, soft layer which is gentle to the skin. I asked my girl how she felt in it and she said "Very nice!" and then she started to run around in the house with just a diaper on. DryPantz also contains Activ-Core which helps to quickly absorb urine and prevent flow-back to keep baby’s skin dry, healthy and extra comfortable. Besides being easy to put on and take off, Flexi-Fit, a snug and soft waist elastic, helps to provide my girl with a comfortable fit. Being one who extremely loves to toss and turn in her sleep (her head and legs can exchange positions by daylight), these two points help to ensure that she moves with greater ease and stay "very nice" through the night. Mummy, last night very nice, this morning still very nice! For the record, so far we have not had a single case of diaper leak with Drypers DryPantz. Woohoo! She can still hop around like a happy kangaroo, just like the ones on her diaper, when she wakes up in the morning. As for me, the best reward is to know that my girls are kept comfortable at all times. 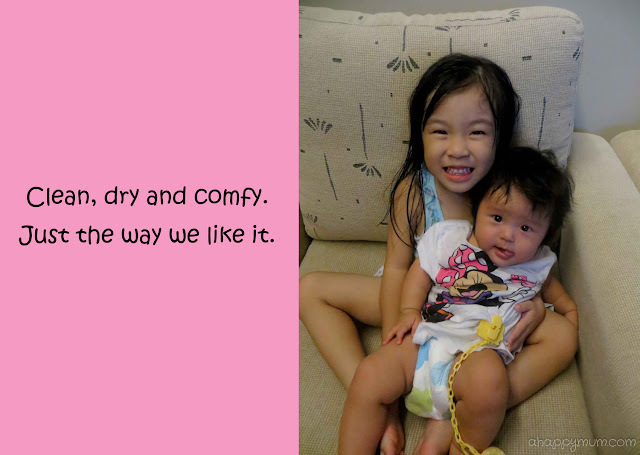 Dry and clean diapers -> Happy kids -> Happy mum. Oh, and to be able to sleep in the night without the need to change diapers, that is an added bonus I love. For those who are interested, don't miss the chance to get your Free Drypers sample now! Disclosure: This review is part of a series of sponsored conversations between Drypers Singapore and A Happy Mum. Product attributes are from Drypers and all opinions are my own. Lil Pumpkin is finally off diapers but ya, Drypers was our most-used brand to date ;) don't worry about Angel and I don't think there's anything to be embarrassed about. She'll get there when she's ready.